How to prevent and treat cold sores naturally! Here I’m sharing what foods to avoid, which supplements to take and which natural oils work for healing cold sores. Cold sores. They’re embarrassing and no one wants them, yet they’re nearly impossible to avoid. In fact, close to 90 percent of adults have been exposed to the virus, and nearly half suffer from them repeatedly. Like many people I was exposed early in life (I have a vivid memory of having a cold sore on picture day when I was in the third grade) and I’ve since struggled with reoccurring outbreaks. There will be times when a whole year goes by without one but other times were I seem to get multiple outbreaks in a few months. Because of this I’ve done a ton of research trying to figure out what causes them, what I can do to reduce their recurrence, as well as, natural remedies to speed up the healing of an outbreak. I’ve also tried almost every product on the market including Abreva (don’t waste your money! ), Herpecin, Acyclovir and Valtrex. I still have a prescription for the generic version of Valtrex, but in the past few years I’ve been working to manage the virus through natural prevention rather than relying on the prescription pills. If you struggle with cold sores I hope this post with my experience and tips is helpful. The herpes simplex virus-1 (HSV-1) is the root cause of cold sores and is different than HSV-2, which is the herpes virus that causes genital herpes. Once the virus enters your body, it takes over cells and orders them to create copies of itself. When the cell gets too full, it explodes, releasing the newly manufactured viruses into the body. The sores that form from the virus are painful infections that result in scabby, crusty sores. While they usually occur around the mouth, sometimes cold sores develop at other parts of the body like the nose and fingers as well. Throughout the seven to ten days that a cold sore looks like a blister, it’s highly contagious and the pus can spread the virus around the body. Not all cold sores are necessarily painful, but it’s not uncommon for them to cause you to feel sore, nauseous or have a headache. Ugh! After ten days or so, this scab will eventually heal over, though the virus remains in your body for good and can resurface again. Not everyone with the HSV-1 virus gets frequent cold sores, and two amino acids, lysine and arginine, are a major reason why. Arginine is required for your cells to produce virus copies, but storing lysine instead means that cells won’t have as much arginine. Because the virus will naturally avoid invading any cells without arginine, a diet high in lysine will help prevent you from getting cold sores. Some foods are naturally higher with arginine than others. If you want to keep your ratio of lysine up to prevent cold sores and heal them faster, it’s best to go easy on foods that are higher in arginine and eat more foods that are rich in lysine. This doesn’t mean you have to completely avoid foods that are high in arginine. I love nuts, coconut, oats and chocolate and I still eat them. I’m just mindful about the fact that they are high in arginine and make sure I balance things out by eating foods that are high in lysine as well. It’s also important to remember that while fish, meats and dairy products are high in lysine, eating too much of these high protein foods can make the body too acidic, which can also cause a cold sore outbreak. As always, moderation is the key. Even if you’ve already been infected with the cold sore virus, there’s a lot you can do to keep your cells on the defensive against an attack. Cold sores do best when your immune system is compromised, so eating the kinds of foods that keep your immunity strong is a proven way to fend them off. 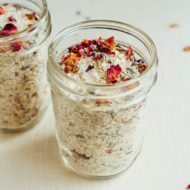 Fill your diet with lots of fresh fruits and veggies (especially those rich in vitamin C) as well as probiotic foods like yogurt, kimchi, sauerkraut. All of these foods will naturally boost your immune system and keep your cells healthy. I starting taking this 7 mushroom anti-biotic during my last outbreak to help boost my immune system and speed up the recover process. 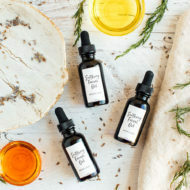 Vitamin E naturally soothes skin and helps repair damage and inflammation, while vitamin C can boost your white blood cell count and help your body defend itself against foreign invaders. Filling up on foods filled with these vitamins will set your body up to defeat any cold sore virus that comes your way. Strange but true, too much sunlight makes your body vulnerable to cold sores. Applying a lip balm that contains sunscreen to your lips throughout the day will reduce your risk of frequent outbreaks. I love this 30 SPF lip balm from Coola. Stress is leading cause of cold sore outbreaks, so try to control your response to the negative things that happen in life and stay consistent with proven stress relievers like your yoga routine to keep your emotions in check! You can also look at taking different adaptogenic supplements to help with stress. As an amino acid that prevents the cold sore virus from establishing itself in cells, lysine is an ideal natural cold sore treatment. You can take Lysine daily (about 1,000 mg 3 x day) as a preventative or once you have an outbreak to speed up the recovery process. I like Super Lysine+ which has 1,500 mg of L-lysine per serving as well as immune boosting nutrients including vitamin C, echinacea, licorice, propolis, odorless garlic. The same company also makes a L-lysine cream that I have used as well. Due to its high immunoglobulin and lysine content, milk is surprisingly effective as a treatment for cold sores. To get the benefits, drink whole milk or eat whole milk yogurt. You can also make a compress from milk to soothe the pain of an established sore. Natural Cold Sore Remedies that Really Work! These options are for those of us that don’t want to rely on antiviral creams or oral medications for treating cold sores. These natural remedies are safe, inexpensive and effective at boosting your immune system to prevent your sores from lasting long and causing pain. My two favorite remedies are tea tree oil and peppermint oil. Tea tree oil has antiviral and antibacterial properties which are known to dramatically reduce both the duration and discomfort of a cold sore. Add tea tree oil to a q-tip and apply directly to the sore. If you have sensitive skin you should dilute the tea tree oil with water. Peppermint oil is naturally antiviral, which makes it perfect for healing pesky cold sores. Studies have shown that peppermint oil can prevent the cold sore virus from getting established, therefore stopping your cold sores before they even start. 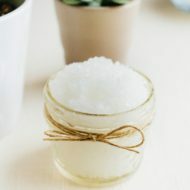 Soak a cotton ball or q-tip with water, then add a drop of peppermint oil and apply to the sore. Useful for treating all kinds of skin conditions, aloe vera gel is effective for cold sores, too. It’s potent formulation of antioxidants, enzymes, and fatty acids will help with the healing process and ease away discomfort during the day. As soon as you feel a burning around your mouth, dab a cotton ball in vanilla extract and hold it to the trouble spot for several minutes. Do this four times daily, and your cold sore will be far less likely to get established. When you want an easy way to strengthen your immune system, Echinacea tea may be what you need. As a powerful immune system stimulator, this flower-filled tea provides your body with what it needs to fight off the virus. I love the Yogi echinacea tea. Once your cold sore is fully formed, there’s a good chance that the virus responsible is already on your tooth brush. Prevent the virus from spreading farther by tossing out your toothbrush in favor of a fresh one instead. While I haven’t tried this remedy, some studies show that lemon balm oil may help heal cold sores. You can apply the oil directly to the sore, but I’ve seen some lip balms made with lemon balm as well. These could be a good preventative option to use daily in place of other lip balms. Icing a cold sore both reduces inflammation and slows down blood flow to the sore, which can speed the healing process while helping relieve pain. Do you have any tried and true methods of preventing or quickly healing cold sores. Share your tips in the comment section so we can all benefit! Just as a disclaimer, always remember to consult a doctor before taking any medications or supplements. Lysine has changed my life. As soon as I feel that tingle I start popping the capsules and usually I can avoid the blister. If I’m too late I do like the Abreva patches – not because they work but because they prevent me from irritating the blister further. I have had a cold sore once a year (or every two years), all my life, so I am very glad to receive this info, Brittany! Thank you. Taking lysine supplements & applying ice are my go-to methods. I’ve found only one over-the-counter that helps is campho-phenique.I’ve read many tips but your list is the best I’ve found. I get a cold sore any time I eat foods that are acidic. I use lysine to prevent and cure. If I do get the blister I use apple cider vinegar to dry it up faster. Thanks for the added advice! HOW funny, I have also been getting cold sores once the third grade when I had one on picture day. I actually had a coldness sore for picture day in the 4th and 5th grade too! Mine are definitely triggered by stress. I Do find that if I put abreva on when I first feel the tingle the cold sore won’t last as long – it starts to dry out after just a couple days. I’m interested to try lysine capsules. The worst is when you get a cold sore that is in the corner of your mouth or when it goes outside the perimeter of your lips. Ouch. Sometimes I feel like I’ve been cursed to have this affliction! Thanks for mentioning that you shouldn’t eat almonds when you get a cold sore. I had no idea that almonds had chemicals that could make a cold sore worse. I am trying to figure out ways to better combat my cold sores. This list of foods to avoid should really help, I will make sure I keep away from them when I have a cold sore. 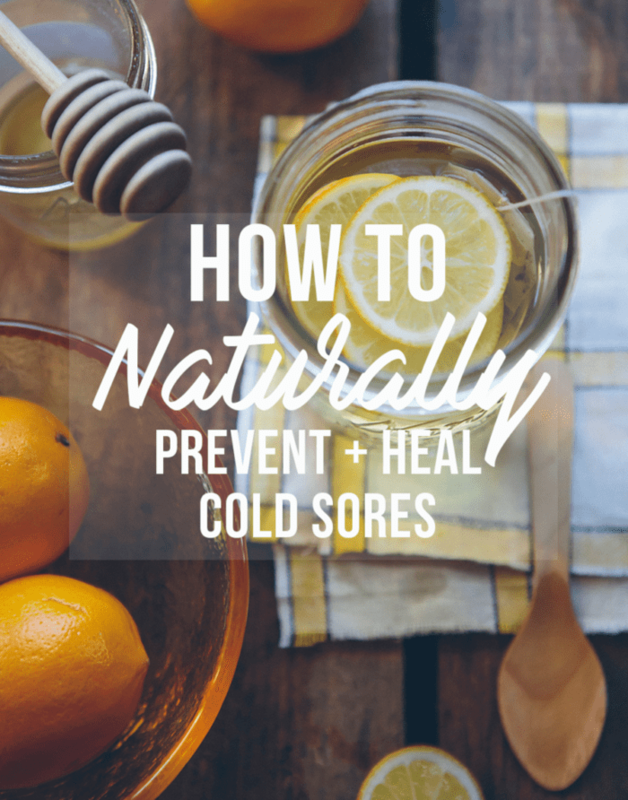 Thank you for the post on how to naturally prevent and heal cold sores. I like the idea to boost your immune system with vitamins and try to manage stress. Stress can causes imbalances in your system which can lead to pimples or if you are prone to cold sores, then they can appear. Vitamins are a great way to simply ensure your bodies immune system is able to combat anything that might cause a cold sore to breakout. i was diagnosed of herpes virus since late 2015 and i was on my doctor prescription ever since, I wasn’t satisfied i needed to get the virus out of my system,i was going through a blog to find new informations about the Herpes Simplex Virus i came across a review of a lady who was cured by Totalcureherbalfoundation gmailcom,I contacted the herbal foundation and they guided me on how to purchase the herbal formula.the herbal products las me for 14 weeks which helps me to get rid of the virus totally. I’ve been getting cold sores more frequently lately and discovered by accident that peppermint oil works like a miracle to keep the sore from breaking out if applied at the first tingle. I’ve been applying it every couple of hours or whenever the tingle comes back and alternating with lysine topical cream. I wonder how long it will take to completely go away with this treatment? I’m going to try to get the lysine tabs, too. Thanks! I have found that ACV with lemon juice helps dry the sore. I then dilute a Qtip with olive oil and place a few drops of oregano oil. I then get new Qtip and seal with raw ACV with lemon juice helps dry the sore. I then dilute a Qtip with olive oil and place a few drops of oregano oil. I then get new Qtip and seal with raw honey. Thank you for sharing this insightful post with us. It was very helpful and effective. Please keep sharing..!! The lemon balm oil or in lip balms works great. But real lemon balm (also known as melissa oil) is very expensive so a lip balm that has even a few drops is expensive to make. But the lemon balm oil is very effective. I started doing Keto and IF back in June. I suddenly started getting them more often, whereas I used to get one maybe once a year. I’ve always known about stress and chocolate, but never knew about seeds and almonds. Almonds have become a staple for me. I also eat a lot more 90% dark chocolate now, too. Things started getting very stressful for me in October, and I suffered big, painful sores on all 4 corners of my mouth for most of October, with a few smaller relapses in November. Very painful 2 months. I’ve been through 4 refills of Valtrex with 4 pills in each, and they didn’t do well in October, but better in November. I actually just got home from Walmart and picked up my 1st bottle of L-Lysine. I hope it helps. Thanks for the other remedies, going to order tea tree and peppermint oil this week! I dissolve aspirin in the smallest amount of water to make a paste.